Mogan Shopping hosts a variety of features developed to assist your shopping experience with us such as: Track My Favorite Categories, Track My Favorite Keywords, Track My Favorite Sellers, Add Label Notes, Translation Tools, Description Highlight Notices, for more on these features, please visit Smart Shopping. The following are just some of our main features you will experience when you shop through us. Mogan Shopping is committed to empowering our customers by optimizing their shopping experience across our recommened auction and shopping malls. Only actual costs on all necessary expenses are charged, ensuring the leanest and most competitive lowest service rates. You can earn big service discounts when purchasing consolidated order packages of 10 items from the same seller thus reducing your service charge since it is based on the order package rather than by item. Through this method you will find a much cheaper overall cost than buying items separately and on your own! Check out our VIP Membership discounts and take advantage of our discount offers. You will also recieve a Greeting Voucher when you become a member. 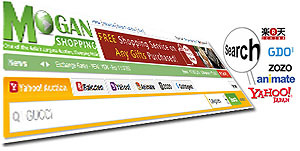 Mogan Shopping accept orders from around the world, take a moment to look at our selected mall directory. Available product lines, shipping rates and fees may vary depending on the delivery address for your order. We operate with the most leading international shipping companies to ensure secure delivery and quality service for your valued purchase and peace of mind. In the unlikely event that you are not satisfied with your purchased item from our recommended shopping sites (except Yahoo! Japan Auction), we may offer the option for you to sell it to us (as a deputy representative) we may offer 80% of the original price as our assured support for you. One of our major features is our expansive search engine, one of the most powerful in this industry. It has the capacity to search across multiple auction and shopping sites, spanning over 120 million items across 150,000 categories, all on one platform, delivering a streamlined shopping experience along with incredible choices, tools, functions and options. Mogan Shopping is devoted to aiding international buyers to purchase or bid on various auction and shopping sites across Japan, including Yahoo! Auction Japan, Rakuten, Yahoo Shopping, animate, ZOZO, GolfDigest and many other selected online global sites (see Mall Directory). We aim to be the best deputy auction and shopping service company in Asia. With our experienced multi-lingual customer service teams, we can assure our customers strong support and assistance where needed, with buyer protection, at competitive service rates on quality purchases across Japan. We accept several payment methods including Alipay, Bank Transfer Wire. As a Mogan Shopping member, you can expect to receive discount vouchers and other benefits to use on your shopping experience. Please check the VIP membership for more details. We take great care in monitoring every purchase you make and in providing personalized service to assist your experience. Our experienced multi-lingual customer service teams are trained to provide high quality service, that meets Japanese standards, to ensure you enjoy a high quality overseas streamlined shopping experience.